I remember the original Puffin cover art for Forest of Doom, the books I got have different covers but the illustrations inside are unchanged. You’re supposed to keep track of your ongoing skill, stamina and luck scores, and to do the fights with dice rolls, which I never did. As a teen I would keep track of what I was carrying in my bottomless backpack, but win all the fights without doing the dice rolls. I also kept track of my path through the story by writing down the sequence of paragraphs I followed to get to the magic 400th paragraph, which usually spelled the successful end of the quest. Flipping through Forest of Doom it was a shock to land on a page I recognised, and follow the story onwards by picking decisions I knew were on the right path. It’s been a minimum of sixteen years since I read any of these books and they are still in my head. 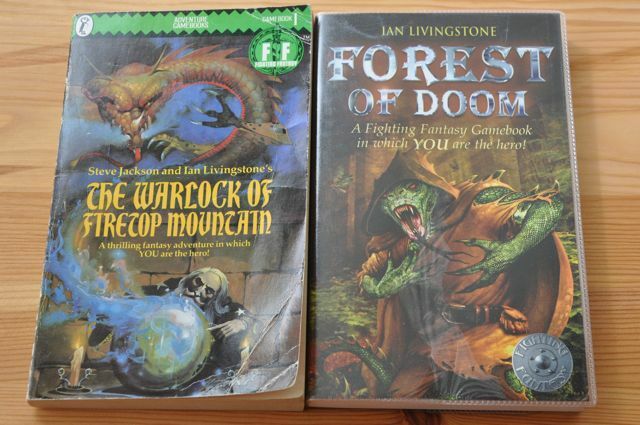 I never played Dungeons and Dragons, but I loved reading/playing these books and I would get one a week from the library as part of my weekly six books. I read through the entire children’s library, out through the Young Adult books and was edging into the adult horror and science fiction when I left for university. What fun books! I’m impressed that you can still find the path you like through one. I had a Doctor Who one of those! Got bored with after 4 or 5 pages. =:o I’m just not a natural gamer, I guess. There is a board game called “Arabian Nights” which is sort of the game equivalent of this. You have an overall quest but don’t have to do it unless you want to, you pick where on the board you are going, receive an encounter and then have a reaction matrix to choose how you will respond. Then you look up that encounter in the Book Of Words and it tells you what happens next. Initially I found it too slow and too much dice rolling, but after a while I enjoyed it.